The European Youth Olympic Festival – EYOF 2019 will be held in Sarajevo from 9th to 16th February 2019. The festival will gather around 1,500 participants from 46 countries. This is actually the biggest sporting event of international character after the Winter Olympic Games in Sarajevo in 1984. 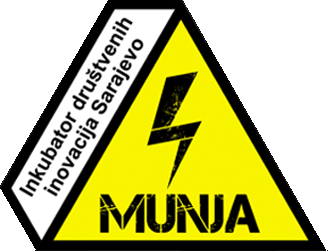 Since this is a youth festival, it is understandable that young people from Sarajevo, East Sarajevo and all of Bosnia and Herzegovina will be involved in its organization and realization. 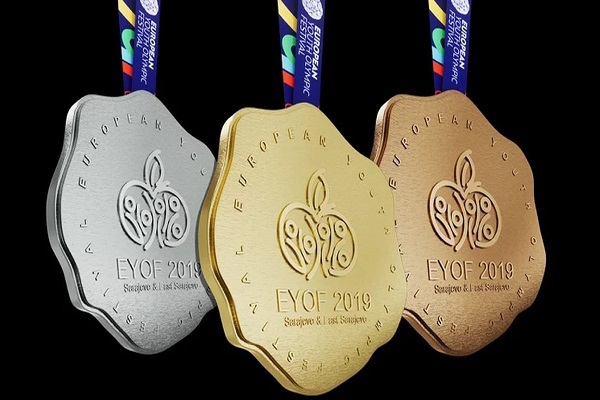 We are particularly pleased to point out that the unique designer solution for EYOF medals was made by former IUS student at Visual Arts and Visual Communication Visual Design (VACD), designer Saira Imamović. On this occasion, we contacted Saira and congratulated on the design of the medals and that, although very young, she created something that will remain as a permanent symbol of a time and a magnificent event. IUS: How did you feel when you found out that exactly your design was selected for making EYOF medals? Saira: I think that every young person has the desire to work on a big project one day, or be part of some great story. Especially when it comes to something that is closely related to the city in which you grew up and lived the most beautiful moments of your life. Being part of the largest international sports event, after the 1984 Winter Olympics, is an honor and a pleasure for me. In addition, I am pleased that people have recognized the amount of effort and energy invested during the design and creation of EYOF 2019 medals. I will take this opportunity and thank the rest of my team, who, with devoted and dedicated work, created the conditions in which we all individually donated and gave the best part of ourselves in the complete EYOF 2019 organization. IUS: What was your inspiration and idea that led you to make the design of the medal exactly the same as it is? Saira: We will all agree that Sarajevo is a unique European city. When I think about the capital of Bosnia and Herzegovina, then I think about the following: dynamic, unpredictable, specific, bold and brave, contemporary, and ultimately modest. For this purpose, I had to create exactly such medals, to transmit a few square centimetres of their surface to all my experiences related to Sarajevo. I tried to make medals that will be unique and recognizable, and at athletes who win those will awaken all positive emotions that I hope will bring from our city. IUS: Did your study at the IUS, specifically at the VACD department prepared you for the challenges of this type and to what extent? How big was the influence of the professors and lecturers on your development of creative thinking, spontaneity, originality and freedom of artistic expression? Saira: Of course, the IUS and the VACD program helped me and prepared me for design challenges. Business challenges are a matter of personal energy and the will to make things good for myself and my company. I am very clear that IUS professors prepared me and gave the knowledge I needed, in order to be able to express my creativity on my own. I owe them special gratitude. I would like to emphasize that I always share my memories proudly and all the students’ challenges that we have as students in front of us. IUS: What does the festival like EYOF means to your generation and generally to young people in BiH? Saira: EYOF 2019 is a chance for all of us to return to a true and positive track, and that the cities of Sarajevo and East Sarajevo show that the only communion and tolerance can be the generator of positive events. Likewise, I wanted to give the opportunity to medals to come out of their design and uniform, be free and open, as same as my message to all young people, participants and visitors of this really important event for Bosnia and Herzegovina. International University of Sarajevo is grateful to Saira Imamović for her time and the interview and we are proud that IUS alumni continuously present both the IUS and our country in the best possible way. They are truly our best ambassadors.